rec. live, Bridgewater Hall, Manchester, 15-16 July 2011 and in rehearsal. DDD. Booklet with synopsis included. Text and translation on CD5. Mark Elder insists that he and the Hallé Orchestra are not in the process of recording a full Ring cycle. That's a great shame, as this Walküre is as fine a recording as their previous and much-lauded Götterdämmerung. Wagner recorded live in concert is rapidly becoming the rule rather than the exception, and full Ring cycles in that format from both Gergiev and Janowski are scheduled for the composer's bicentenary in 2013. No doubt both will be impressive offerings, but it is hard to imagine that either will have anything further to say on Walküre than what Mark Elder sets down here. The performance was split across two consecutive evenings at the Manchester International Festival in 2011. There were no patch sessions, but the mics were in place at the rehearsals, and some of this has been edited in. The result manages to capture the best of both worlds – it's as note perfect as a studio recording, but as atmospheric and dramatically coherent as a concert performance. From Mark Elder's description of the project, the whole thing was much more precarious than the assured quality of the recording suggests. The concerts were only made possible through sponsorship hastily convened by the Manchester Festival. And the cast includes three singers, Sarah Castle, Yvonne Howard and Elaine McKrill, who were drafted in as short-notice replacements. But Mark Elder is clearly the sort of conductor who would only embark on such a project if he knew he could do it full justice. He has rehearsed the orchestra magnificently, not only to follow his occasionally esoteric tempos, but also to maintain a consistency of spirit and tone across the huge spans of each of the acts. Elder also has that crucial operatic quality of being able to give his soloists, both vocal and instrumental, the space they need to shape their melodic lines, while still maintaining the symphonic logic of the whole. And the orchestra repays his confidence in them with inspired playing at every turn. The horns deserve a special mention. They are kept busy throughout this opera, but rarely have the horn parts sounded so fresh and vital as here. Great woodwind playing too. The woodwind soloists really benefit from the quality of the sound recording, which both balances them against the ensemble, and picks them out from the centre of the group with consistent clarity. You'll also hear better trumpets and trombones here than on most other recordings of the work. The performance is very much an interpretation, with Mark Elder imprinting his musical personality on every phrase. Elder's pacing of this music is similar to the way he speaks. It is steady, clear and undemonstrative. Clarity of phrase and rhythm comes though accentuation, from the heels of the strings' bows and from the brass, while the passion and drama are projected through the very wide dynamic range. The orchestral set pieces – the Act 1 Prelude, the Ride of the Valkyries, the Magic Fire music – are all on the steady side as far as tempos go. But the definite and deliberate accentuation ensures that the slower speeds never threaten the atmosphere or drama. Everything feels like an emphatic statement, and nothing is ever treated as trivial or transitory. 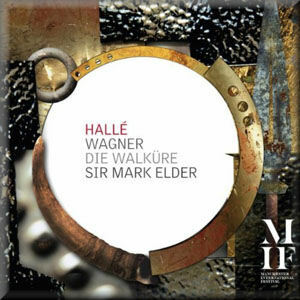 In the context of other famous recordings of the work, Elder's steady tempos resemble Haitink, the agogic weight from the orchestra approaches Solti, while the communication from the podium and the immaculate preparation are more akin to Karajan. There are no huge names in the cast, which ironically helps to maintain consistent quality between the singers. Every one of them is equal to Wagner's challenges, and despite the concert hall setting, there is a real feeling of dramatic involvement from each of the leads. Susan Bickley is a suitably angry Fricka, while Susan Bullock's Brünnhilde sounds both wayward and emotionally complex. The singers also articulate the German with a rare clarity, another quality that benefits from the excellent sound engineering. The bass in the mix is particularly strong and well-defined, all the better to hear the excellent performances from the lower male voices, Clive Bayley as Hunding and Eglis Silins as Wotan. No cast for a Wagner opera is completely flawless of course. Susan Bullock is considered one of the finest Brünnhildes of today, but I find her wide, penetrating vibrato excessive, especially on the top notes. But her performance here is less abrasive than on the recent recording of the work from Frankfurt Opera (Oehms Classics OC 936). Despite the fact that the opera was divided across two nights, some of the singers can be heard to tire, which is perfectly understandable given the duration and intensity of many of the monologues. So Stig Andersen's Siegmund sounds much fresher at the start of Act 1 than at the end. Eglis Silins has similar problems towards the end of Act 2, although he's back on form for Act 3, and then manages to maintain the tone right until the end. These are minor quibbles though, and the overall impression this recording gives is of consistently high musical standards from singers and orchestra alike. Excellent sound quality too, all of which suggests significant investment to make the recording the best it could possibly be. The packaging is a little less opulent. The booklet gives only a track listing, very brief synopsis and orchestra list, all on unlaminated paper. An additional CD-Rom is included with images of the concerts and a pdf libretto. In fact, there are only three photos, a cursory offering at best, and the libretto seems redundant, considering that it is widely available online. Personally, I'd rather a pdf of the full score, which could easily be added at no further expense to anybody. But the packaging is the only concession to economy here, and if the qualities of the recording itself were not enough to recommend the release, the budget price tag ought to seal the deal. Even the reissues of Solti and Karajan conducting the opera cost more than this brand new one. So here's hoping that the resources and opportunities will be found for a Rheingold and Siegfried in the same series. Should they materialise, this could become one of the great Ring cycles of our times.